Ring is the company that started it all when it comes to doorbell cameras, and it still makes the most popular video doorbells on the planet. The Ring Video Doorbell 2 is the company’s latest and greatest model and it’s well worth the $200 retail price — just ask the 2,300+ people who have given it a 5-star rating on Amazon. 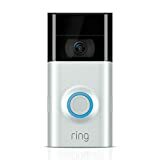 Of course, just because it’s worth $200 doesn’t mean you should pay that much, and it just so happens that the Ring Video Doorbell 2 is on sale for Black Friday at a deep discount. Snag one soon while they’re still in stock and you’ll pay just $139!